APP Chairman Larry Shaw addresses the crowd at the annual APP/LEAD meeting held at Northern Maine Community College this past Wednesday. 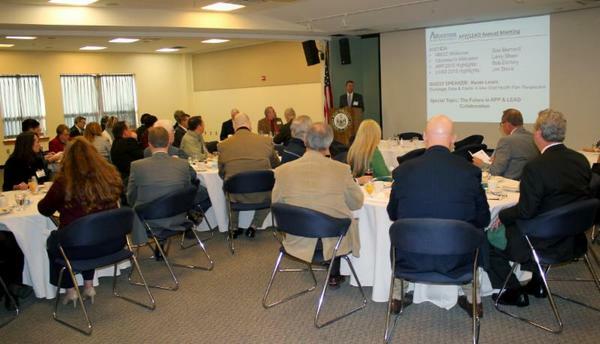 APP and LEAD join forces to form a new, better "Partnership"
AROOSTOOK COUNTY - The Aroostook Partnership for Progress and LEADers Encouraging Aroostook Development joined to better serve the economic development needs of Aroostook County. For the past six months, the executive boards of the organizations have been meeting to work out the details of how the merged organization would operate. "One team, one private sector segment, one expanded board of directors, greater collaboration among economic development organizations, inclusion of the Loring Development Authority and Southern Aroostook Development Corporation - these are some of the attributes that will make the Partnership a better focused effort," Dorsey explained. "Most of the comments I am hearing from investors indicate they are happy with this direction and wish this had happened earlier." Dorsey added another driving factor is the need to engage younger people in the leadership of the organization. "It is their future and it only makes sense to advocate greater involvement of young professionals," he added. The combined organization, which was officially unveiled Wednesday, Nov. 4 at the annual APP/LEAD meeting, is named the Aroostook Partnership. Chris Anderson has served on the executive boards of both APP and LEAD and has a unique perspective on the merger. "Both organizations have done tremendous work over the years in the effort to enhance our economy," he said. "The slate of current activities is impressive. The leadership of both organizations does not want to lose those specific things until the time comes that an activity is seen as unnecessary or ineffective to reaching our goals. As budgets tighten and most importantly, as our volunteers become tired from the continuous, arduous task of economic development, we seek fresh ideas and new energy to keep the vision alive and mission on task. Expanding leadership to give voice to all those interested in a better tomorrow for Aroostook is a key element to combining forces. In addition, the business investor/member need not be confused by having too many organizations with multiple or redundant missions pushing a seemingly uncoordinated approach to economic development. One voice, one vision, one mission will streamline all efforts." Events such as Entrepreneur of the Year, Aroostook Day at the Legislature and advocacy are still priorities for the new organization, along with the APP focus on "Education to Industry", the forest products industry, diversified agriculture, renewable energy and manufacturing. Jim Davis served as President of LEAD this past year and he is confident the legacy of the organization will live on. "Whether it is legislative advocacy regarding railroads and the North/South Highway, weekly update calls to our representatives in Augusta, Aroostook Day at the Legislature, the Entrepreneur of the Year program, our Opportunities Aroostook web site to showcase employment opportunities, all of these activities bring people together for the purpose building on our strengths and growing the Aroostook economy," he said. "Not only will these activities remain a part of the Aroostook Partnership, they'll be positioned within the new organization in such a way that they'll be highlighted and take on even greater prominence in the community." "This merger makes sense for the LEAD membership as well as the APP Investors," said former LEAD Executive Director and current Madawaska Town Manager Ryan Pelletier. "The new organization will be focused and responsive to the needs of the private sector in Aroostook County. I am excited about the possibilities and the opportunities for future growth here in the County under this new partnership." "This allows us to work as one team and approach economic development punching with a fist instead of five fingers," said Dorsey. The first board meeting of the Aroostook Partnership will be Friday, Dec. 11 in Caribou in the Northern Maine Development Commission boardroom. CARIBOU - The deadline for agricultural producers to complete a marketing survey to better connect with markets downstate has been extended. The Great Region Growers' Survey for Aroostook, Washington and Piscataquis counties is a project of Northern Maine Development Commission (NMDC), Sunrise County Economic Council (SCEC) and Piscataquis County Economic Development Council (PCEDC). "Increasing connections between local production, market development and efficient distribution of products is the focus of a recently awarded Rural Business Development Grant from the U.S. Department of Agriculture," said Alain Ouellette, Planning and Development Division Director at NMDC. "We want to learn directly from growers about the challenges and opportunities of participating in a regional farm production and distribution initiative." The 15 question survey, developed for Aroostook, Washington and Piscataquis farmers and agricultural product producers, should take approximately 10 minutes to complete. "Individual responses will not be shared. Instead, responses will be aggregated without identifying individual farms or farmers," added Ouellette. 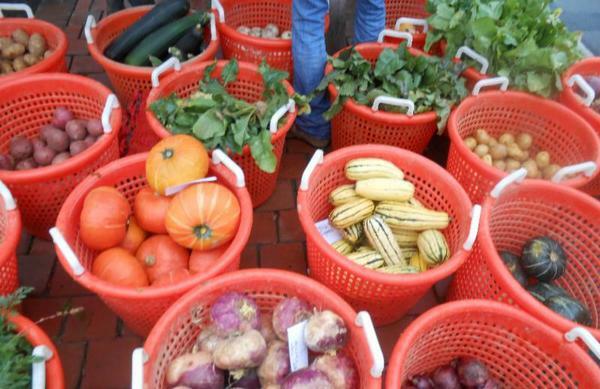 "The information will be used to develop a plan to improve farm marketing and distribution across the state and in New England." Questions on the survey include, total acreage planted, primary crop (including livestock), distance to present market, current transportation and future needs. The deadline for completing the survey is November 20, 2015. For filling out the survey, all names will be entered into a drawing for a $150 gift card. 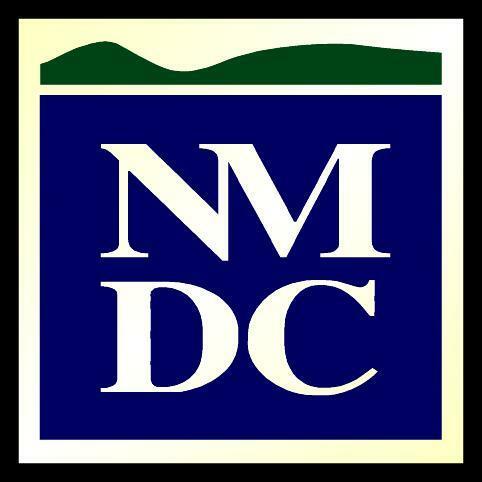 The survey can be found at www.nmdc.org or a paper copy can be requested by contacting Judy Dinsmore at 498-8736. FORT KENT - Quigley's Building Supply, located at 35 West Main Street in Fort Kent, will have a new owner. S.W. 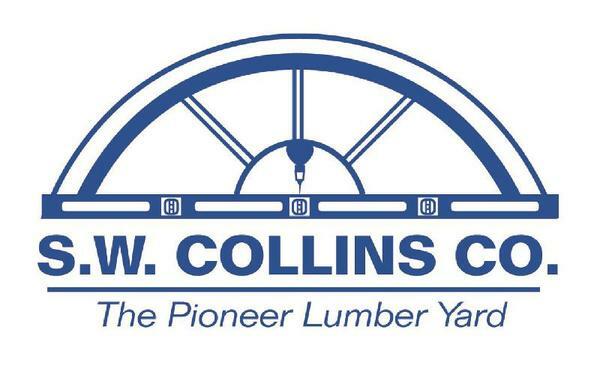 Collins Co. is expanding its fifth-generation, family-owned lumber and building supply company to include Quigley's family business in the St. John Valley. This change preserves the rich history of both multi-generational family-owned companies. The Quigley family has operated their business since 1944 after buying H.W. Coffin Lumber & Building Materials. Quigley's Building Supply quickly developed a key role in the Valley as it became the general contractor for some of Fort Kent's largest projects, such as Fort Kent Community High School, Pinkham Lumber Mill in Ashland, and some of the buildings at the University of Maine at Fort Kent. Similarly, S.W. Collins Co. began in 1844, with the original Samuel Wilson Collins building a sawmill in Caribou that flourished in the central Aroostook area under his leadership. These similar traditions and values as a multi-generation family business will remain as the foundation of the Fort Kent location and the entire SW Collins Co. moving forward. S.W. Collins Co. has lumber and building supply stores in Caribou, Presque Isle, Houlton and a recently opened store in Lincoln. The company also provides kitchen and bath design services at the Design Center in Caribou and at each store location. For more information about S.W. Collins Co., visit their website at swcollins.com.